In this room we leave behind the private lives and everyday existence of the community to take a bird's eye view of Catalonia's Jewish quarters. The Jewish quarters formed special districts of various cities in medieval Catalonia. The alleys, dwellings, workshops and other workplaces (bakeries and slaughterhouses), shops and ritual buildings (synagogue and baths) provided the framework where Jewish life could take place in medieval Catalonia. 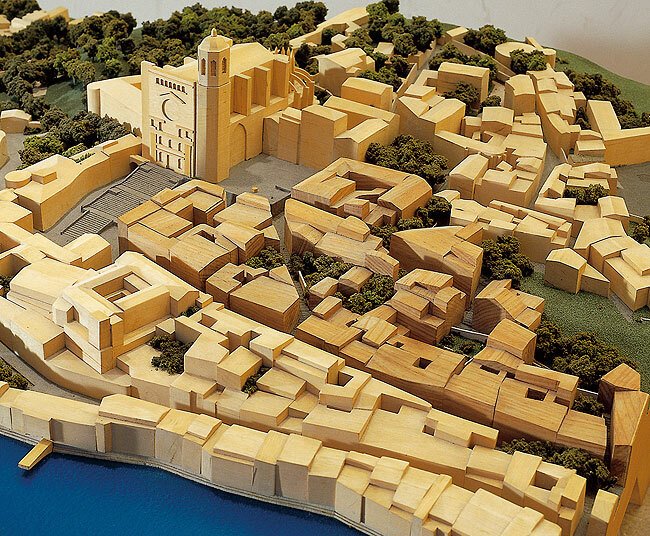 In this model we can see the boundaries of the Jewish Quarter in Girona as they were in the late 14th century. The outer limits of the Jewry changed over time, and after the attacks that occurred in 1391 the so-called “reduced Jewry” was established, a much smaller area which was still expected to give house and home to all the Jewish families in the city.